1. The temple is literally a military bunker of some sort; it is fenced with high wall and metal bars, reinforced with bulk wires. I am surprise there is no guard posted. 2. Visitors are sacred, even during special festive period. 3. 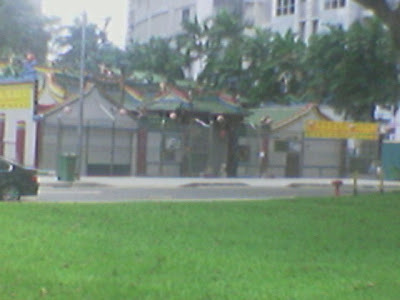 In the midst of prime economic area, neighbor’s land and building has all given way to more important money making structure, but the temple still stood. 1.) It is an obscenely rich treasury vault or secret base of some kind. 2.) Some very very important people are behind it. 3.) The temple has great cultural and historical importance. 4.) It cannot be removed because of Fengshui.